Mlle. Claire Joseph Hipolite Leyris Delatude-Clairon; Issey-près-Paris, sold 19 March, 1796 [29 Ventose An 4me de la République Français]. Erik Magnus, Baron de Staël von Holstein, Chamberlain to the Queen of Sweden and Swedish Ambassador to France and thence by descent and sold in the 1920's. Mrs. Warfield, St Louis, Missouri and thence by descent to the present owner. A group of ten drawings by Christoph Ludwig Agricola, clearly from the same series as those included here, were sold Christie's London, 14 December 2000, lot 56. Agricola (1667-1719) was a German landscape painter, who was both born and died in Regensburg. He spent a great part of his life in travel, visiting England, the Netherlands and France, and residing for a considerable period at Naples. His numerous landscapes, chiefly cabinet pictures, are remarkable for fidelity to nature, and especially for showing nuanced depictions of light. His pictures can be found in the collections of Dresden, Braunschweig, Vienna, Florence and Naples. Baron Erik Magnus de Staël von Holstein (1749 in Loddby, Sweden-1802 in Poligny) was Chamberlain to Her Majesty Queen Sophia Magdalena of Sweden and, in 1783, he was appointed chargé d'affaires to the Court of France, and in 1785 he was named Ambassador to France. On 21 January 1786 he married the daughter of the French Minister of Finance Jacques Necker, Mademoiselle Anne Louise Germaine Necker, who was to achieve fame as the 'Madame de Staël'. The present lot can be identified as from the 'BOUDOIR DU PREMIER ETAGE' from a house in Issy purchased by the Baron de Staël from a Mlle. 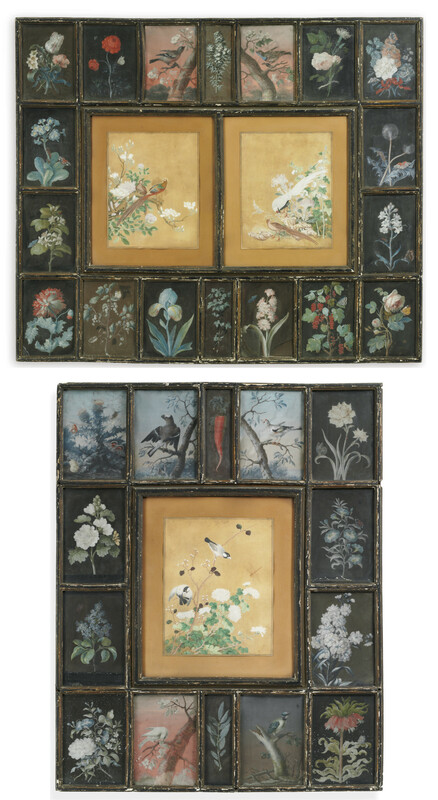 Delatude-Clairon in 1796, along with the entire contents: '...Il est meublé par quatre vingt tableaux sous verre encardrés dans des voliges et représentant des fleurs, des oiseaux des papillons, peints par Melles Ditchs at des papiers de la Chine...' (p. 18). This legal transaction, along with an inventory of the contents of the house, are described in detail in transcribed documents accompanying the present lot. Apparently the watercolors remained in the same room until they were purchased by the grandmother of the present owner. Please note the central images are Chinese School and 18th century.